We should not compartmentalize our lives. 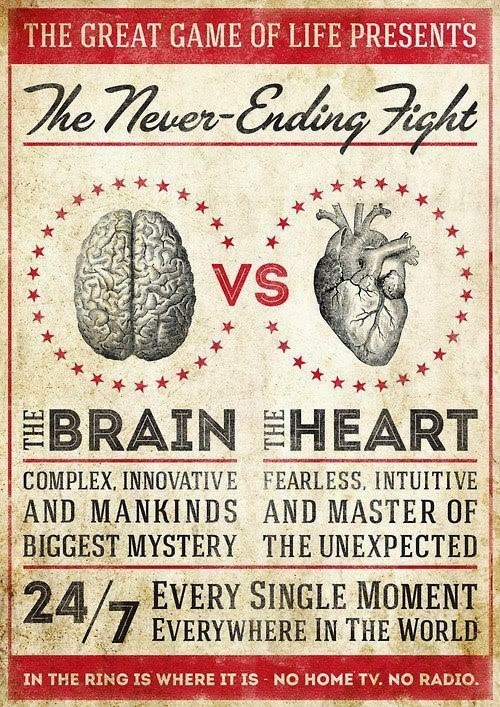 The head and the heart are not two opposite choices or paths. They are aspects of who we are. Through them, we perceive, gather, and interpret data. The mind is the centre of our cognitive and intellectual powers. The heart is the centre of emotion, affection, and love. In his book Rediscovering Devotion to the Sacred Heart of Jesus, Fr. Jim Kubicki, SJ, points out that in biblical language the heart is understood as the inner self. Our inner self is the seat of wisdom, where all the faculties of the soul come together: thoughts, will, emotions, and feelings. Decision-making is not about choosing between the head or the heart; rather, it is about paying attention to our interior movements – thoughts, imaginings, emotions, and feelings – in order to do what is more life-giving, what helps us to grow closer to God, and what helps us to serve better. I know decision-making can be a difficult process. I have had moments when the right decision seemed obscure. Silence, prayer, and talking to family and friends helped me recognize and understand the motions of my soul. A few months ago, I had a falling out with my best friend. The tension in the friendship had grown over the last year, and unfortunately this valuable friendship came to an end. It broke my heart. I was both sad and angry. But I had to make a decision about the best way to care for my friend after the end of our friendship. My thoughts and my feelings about the situation were conflicted. I brought all my arguments and emotions to prayer. I also spent a healthy amount of time talking it over with a couple of friends. It took me some time, but in the end, I was able to discern what was happening within me and what I had to do. I was able to make a decision, not only by paying attention to my thoughts and feelings, but by discovering the way God loves my friend. My friend Julie recently reminded me that God deeply desires that we grow in communion with his Heart. As we grow closer to his Heart, we naturally make wise decisions. The art and science of decision-making depends on our ability to open our hearts to God, to let him transform them. The more we pay attention to our interior movements, the more we are invited to contemplate the movements of the Heart of Christ. In this way, we learn to feel, love, see, and act the way Christ feels, loves, sees and acts. Amen and amen. Thanks for reaching out to me via Twitter and inviting me to read this fine post. 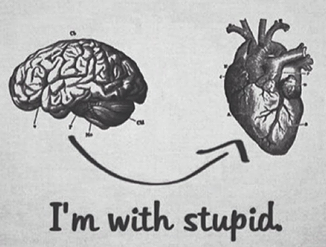 I've long thought and felt that the dichotomy between brain and heart is false. I think and feel similarly about attempts to separate body, mind, and spirit. I'm tempted to say one need not be a rocket scientist or Jesuit to figure this out, but clearly it helps to be either...or both. Thank you for your comments. I have learned that rocket scientists and Jesuits find inspiration in people who are passionate about what they do. I am certainly inspired by your work on #chsocm. I am thankful for the ways in which you invite us to think about the church and social media. I am also glad to find people who think and feel the inaccuracy and danger of a perceive dichotomy between the head and the heart.